L’AS ラス is a gem of a restaurant in the quiet backstreets of Minami-Aoyama. Boasting a diverse wine list and creative Franco-Japanese menu, L’AS is an absolute must-visit with its fresh ingredients and stunning flavors. My friend Mizuha and I dined there on a Sunday night and the restaurant was buzzing with energy. The animated chatter of diners enjoying their wine pairings pleasantly echoed throughout the restaurant. After the first couple sips of wine and bites of my caramel foie gras sandwich (it tastes just as phenomenal as it sounds), I wish I discovered L’AS earlier. Highlights of our meal include the crab miso with potato purée and the roasted duck with figs. Definitely start the night off with some champagne, sit back, and enjoy the culinary adventure created by Chef Owner, Daisuke Kaneko. At L’AS there is only the omakase menu but every so often it is changed to accommodate new seasonal ingredients and recipes. As we visited in September, we were excited to find traces of late-summer and early-fall ingredients in all our dishes–cherry, fig, pumpkin, etc. For my fellow wine drinkers, I highly recommend getting the wine pairing to go with each course (alternatively, they also offer wines by the glass). L’AS has a very hospitable crew of waiters and knowledgable sommelier so you will be properly pampered. Rest-assured that there is an English menu so definitely ask for one at the beginning–you’ll want to know all the flavors and ingredients you’re tasting. One of the many wine pairings of the night, this sweet wine was paired with the rich duck-liver mousse–I could’ve started the meal with this, AND ended the meal with this. If you do the wine pairing ‘vin de degustation’, you’ll start the night with the clink of champagne glasses! Grace Gris de Koshu: I adored this white wine–using Koshu grapes from the Yamanashi Prefecture, this wine was fun and fruity with a slightly bittersweet aftertaste. The star of the night is the L’AS special crispy foie gras sandwich with hints of caramel. Served in a little pouch, the crispy ice-cream-like sandwich was ridiculously rich and good. I definitely would go back just to have this again. Homemade mozzarella cheese–we were told this was JUST made in the kitchen. The consistency was chewy, akin to the Japanese mochi rice cake, and the olive oil drizzled on top really enhanced the overall sweetness. Seasonal vegetable pot-au-feu in a delicious beet jelly. The vegetables were fresh and grilled to a nice crispiness. I was so enamored with the beet jelly I made sure to spoon everything up! Crab with potato purée, crab miso, and topped with parmesan and a brilliant yolk. Served with fresh bread, the dish is meant to be devoured and scooped. The paired white wine really enhanced the rich flavor of the crab miso. Grilled largehead fishtail (also known as Japanese cutlassfish) with marinated eggplant and pork. I was a big fan of the crispy fish skin contrasting the eggplant texture. Interestingly, they served this dish with a red wine that pairs well with seafood (personally, I still found the wine a little too overpowering in flavor and would have preferred a lighter white). 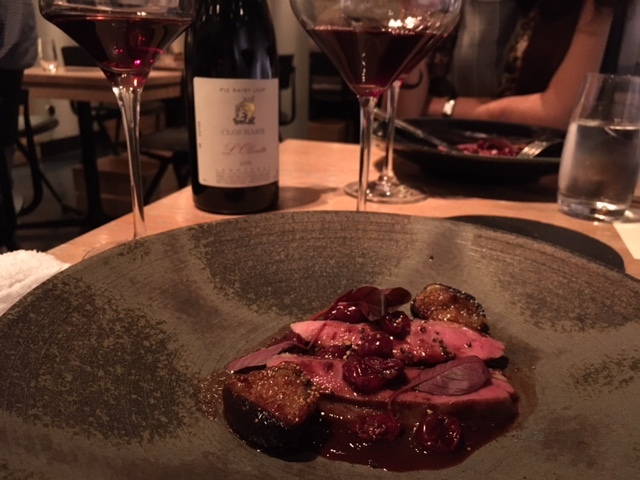 Roasted duck with grilled figs and a cherry-wine sauce–medium rare duck with seasonal figs and brilliant dashes of cherry? Absolutely amazing. This was a really well done dish and could easily be served as a main entrée in a Michelin establishment. Pumpkin ice cream with a caramel sauce and tasty candied walnuts–for all my spiced pumpkin latte lovers in the USA, you would love this! The intimate restaurant as it’s nearing midnight–the open kitchen is a rare sight in Tokyo but I think it adds to the aesthetics of the beautifully designed restaurant interior. Simple lines with a Scandivanian-like simplicity of furniture, L’AS evokes a comfortable atmosphere for dinner. Rising star chef Daisuke Kaneko has his two restaurants side by side: L’AS and Cork. With L’AS being so impressive, I will definitely be visiting Cork as soon as I can. To have such a phenomenal dining experience at a reasonable price (5,000 yen for the omakase; additional for the wine pairing, ‘vin de degustation’) is truly one of a kind. Overall, I was thoroughly impressed by the creative menu at L’AS and highly recommend a visit for both visitors and locals. Using French techniques to enhance the taste of Japanese flavors and ingredients, L’AS will definitely impress your palate. The food looks and sounds amazing – especially caramel foie gras sandwich and the duck. I’m a huge fan of French cuisine and can never pass an opportunity to try a new place. Thanks for the recommendation!